This ‘Four Grain’ bottling represents a relatively recent addition to the Gooderham & Worts lineup marketed by Corby Wine & Spirit Limited. It utilizes a mash-bill incorporating rye, wheat, barley and corn, and replaces a Small Batch release, which was available a decade or so ago. 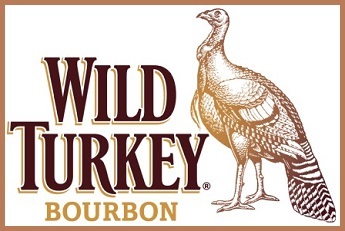 Among the numerous Bourbons currently on the market, Wild Turkey 101 represents an established, reasonably priced and widely available classic. It utilizes a traditional corn-rye-barley mash-bill that emphasizes the corn component, and contains whiskies aged for as long as six to eight years. The new oak barrels into which the fresh spirit is transferred are heavily charred. Wild Turkey Distillery is located in Lawrenceburg, Kentucky, and is owned by Gruppo Campari. Master Distillers Jimmy (a legendary figure in the industry) and Eddie (Jimmy’s son) Russell oversee operations. Bulleit 10 Year Old comes in a retro-styled bottle. Perhaps this fact has something to do with the 'Frontier Whiskey' connotation on the label.